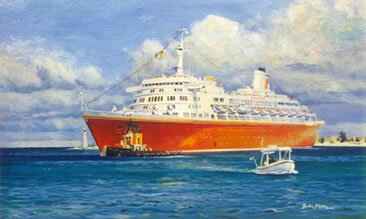 Marine painting by Gordon Frickers 50 x 76 cms (20″ x 30″), oils on canvas, available. A result for and from a visit to the port of Nassau as a guest on board SS Emerald Seas. Starship Oceanic at that time was owned and operated by the Walt Disney Corporation, used as a two center holiday offer (the other week being at Disneyland). I was fortunate to watch her and recorded her maneuvering in the entrance to Nassau, capital of the Bahama isles.